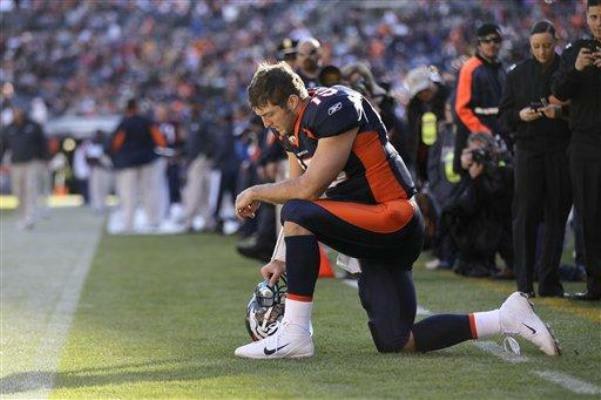 Long Island High School Students Suspended For "Tebowing"
After six straight wins, you aren&apos;t going to escape the name Tim Tebow. Just accept it. The Broncos QB&apos;s signature move, "Tebowing", has swept the nation, but one Long Island high school isn&apos;t having it. Four students at Riverhead High School were suspended this week for Tebowing in the hallways, which the school believes is a safety hazard. Riverhead High let two of the kids slide after it was revealed that they hadn&apos;t been given the same warnings as the other two. Regardless of whether you find it annoying, your favorite team took an L to Tebow & Co., or you just hate the dude, it&apos;s not serious enough to warrant a suspension. Just let the kids cook.